* Automatically downloads new versions of DotA and displays the changelog! * Replaces the Warcraft III Icon on your desktop. * Options to select additional programs (such as ListChecker) to run with Warcraft III. * Run any combination of programs, (GGC, Banlist, LC, etc) in any order, automatically. * Displays the latest news from DotA-Allstars.com! Issue: Banlist will not open properly. Reason: This is because the launcher does not have the ability to stagger program execution, when banlist starts war3 is not fully loaded so banlist complains. *hope icefrog can set a function in map for kick afker..
thank you for inventing this!!! ser itlog ko, mas cute sa itlog mo! 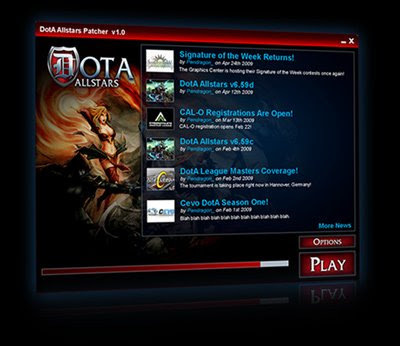 The DotA Allstars Patcher is no longer for download at dota-allstars.com. The patcher must be completely changed to reflect new from playdota.com, and show the latest map and latest AI map (all final), with changelogs for each, and the new name must be "PlayDotA.com Patcher". I feel that the old patcher is almost no longer in development. Yup, looks like since IceFrog leave Dota-Allstars.com, the project is stopped..